My kids are still too young to write even their own name, but if they weren’t, they would have a blast with SparkleFish. 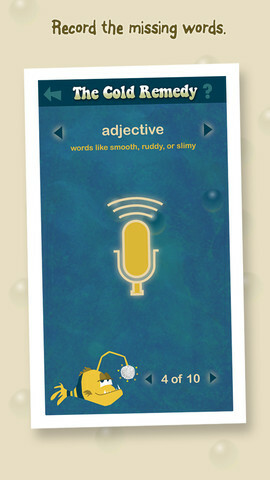 Our Free App of the Day is like MadLibs for your iPad and the results will have your kids howling with laughter. SparkleFish is a hilarious audio story completion game that will have you laughing uncontrollably. With SparkleFish you can record creative words in your own voice for playback inside surprising, ad-lib stories. If you enjoy Mad Libs, then you’ll really love SparkleFish. It’s fun for all ages, species, individuals, groups, etc. * Buy “story packs” (each with 5 stories) for more fun! * Record the stories as many times as you’d like.